Please sign our petition and send email and postal letters to the Sponsors of PyeongChang 2018 Winter Olympics. Mailing addresses are provided below. As sponsors of these Olympic Games, we are contacting you to ask for your help: please will you consider withdrawing your sponsorship of the PyeongChang 2018 Winter Olympics? You have the power to influence the South Korean government by putting pressure on them to end the horrific cruelty that is routinely inflicted on the animals involved in all areas of the dog and cat meat trades. Did you know that, in South Korea, each year an estimated two and a half million dogs are electrocuted, hanged, or beaten to death? Were you aware that thousands of cats are slaughtered for soups and so-called “health” tonics - often by throwing the living animal straight into boiling water? These animals are deliberately killed in the cruelest ways imaginable, because many South Koreans believe the insidious myth that the more an animal is made to suffer, the more delicious or efficacious their meat products will become for the consumer. The practice of eating dogs is not widely accepted in South Korea; it gained popularity after South Korea was left devastated by the effects of war. What, then, can the justification be in 2017 for continuing this aberrant practice, with South Korea having become such a prosperous nation? What excuse can the authorities give for allowing these illegal trades to continue unpoliced, unpunished, and unchallenged? We now ask that you do not endorse a nation that endorses such unspeakable cruelty and shows so little consideration for the health and happiness of its citizens. Please insist that the dog and cat meat trades are ended now - and ended permanently – or take action by withdrawing your sponsorship. 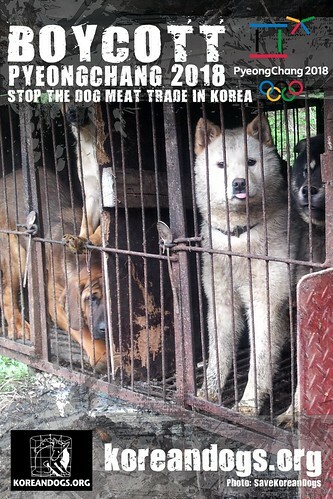 Click HERE for Boycott PyeongChang 2018 Action Center. Click HERE for the most updated information on Corporate Sponsors. it’s awful, I am terrified to see how our beloved dogs and cats are treated in this country ! and how other civilised countries turn their backs on this horrible massacre as soon as money is at stake !!!! I SIGNED AND I SENT THE EMAILS EVERYWHERE !!! Stop eating dogs ? or cats ? THE WAY THESE ANIMALS ARE KILED IS THE SHAME OF THE COUNTRY, THE PEOPLE ARE NOT HUMANS, YOU CAN NOT BE HUMAN AND BE ABLE TO TORTURE AND KILL ANIMALS WITH SUCH CRUELTY. WHAT IS WORSE IS THAT THE WORLD WATCHES AND DOES NOTHING TO STOP THIS INSANITY!! ASKING TO DONATE IS NOT GOING TO STOP THIS ANIMAL CRUELTY AND CRIMINAL BEHAVIOUR TOWARDS THEM. A TOTAL BANN TO THIS TRADE MUST BE TAKEN NOW!! Toyota’s message: Toyota Motor Sales, U.S.A., Inc. is a subsidiary of Toyota Motor Corporation in Japan, which is a sponsor of the upcoming 2018 and 2022 Winter Olympic Games and the 2020 and 2024 Summer Olympic Games. Toyota has no say in or control over the actions or decisions made by the South Korean government. In addition, Toyota does not have a representative on the International Olympic Committee (IOC) board, nor are they a member of the IOC. Thank you for sharing, Billie. Would you be so kind to forward this email to us directly? It sad when these very large companies value money more than these poor helpless animals. These animals are being killed in the most barbaric way! I will never support any of these large companies again and will continue to donate and sign every petition until this horrific nightmare ends and these animals are safe. The people who carry out these horrible acts should be jailed!!! Stop eating dogs and cats. They are loyal. Stop eating dogs and cats NOW!!! Please !!! This Cruelty must immeditaly stoped. I am horrified by these big corporations sponsoring the Olympics in this barbaric country. I wouldn’t want my brand to be tainted by the suffering and misery of these animals in view of the prestigious Olympics..i will not only boycott watching the Olympics I am boycotting all the products made by the sponsors. We must fight hard for these beings we share the earth. It is immoral and an atrocity. Boycott the OLYMPICS !!!! This is an EVIL TRADE that has to stop. Harsh prison sentences just has to be served against these perpetrators of such CRUEL ACTS and those who ignore this are equally as guilty and thus their GOVERNMENT is more to blame than anyone else for not legislating against those subhuman evil people. Even Taiwan has stamped this stupid practise out with severe punishment and therefore has become a beacon of light in that area which has no feeling or indeed understanding of our animal brothers at all; I wonder if they would enjoy being tortured themselves ??? Dogs and cats are not cabbages. It is time there was a WORLD LAW PROTECTING ALL ANIMALS BEING SUBJECTED TO CRUELTY AND ENFORCED BY UNITED NATIONS OR A SIMILAR GROUP WITH REAL ENFORCEMENT POWERS to end this for GOOD !!!!!!!!!!!!!!!!!!!!!!!!!!!!!!!!!!!!!!!!!!!!!!!!!!!!!!!!!!!!!!!!!!!!!!!!!! Hunde sind soziale Wesen wie wir, sie helfen dem Menschen, hör sofort auf die Tiere zu foltern und zu fressen, was seid ihr für Babaren,unsere Organisation Menschen für Tierrechte wird das auf der ganzen Welt verbreiten und das wird euch wirtschaftlich treffen dir Menschen werden eure Waren meiden, hört sofort auf damit ihr verkündigt euch an der Schöpfung.